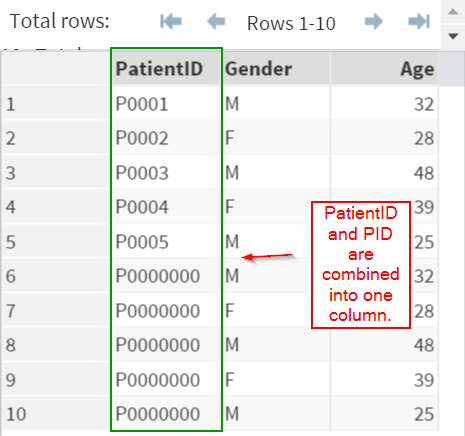 Both the REPORT1 and REPORT2 data sets contain the patient ID, gender, and age. Let's combine them using the SET statement. 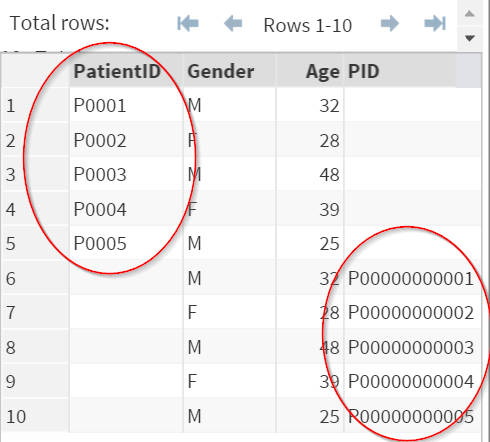 The PatientID and PID are not combined into one column because of the different variable names. In order to solve this problem, one of the variable names must be changed. This can be done by using a RENAME statement. The variable name PID was renamed as PatientID. 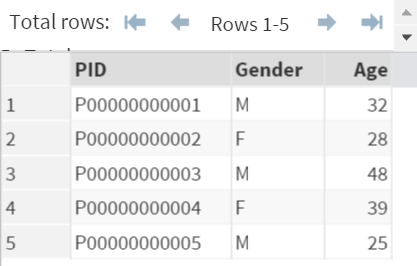 As a result, the PID and PatientID are combined into one column. However, there is another problem when the two were combined. 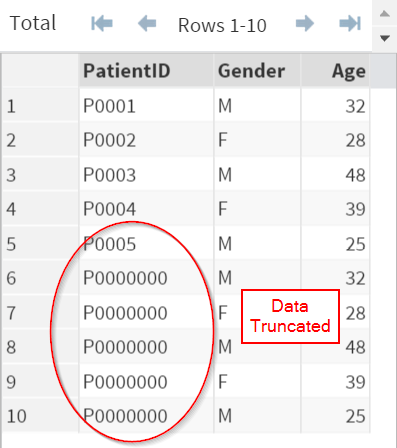 Data truncation is another common problem when concatenating data set. This is due to the inconsistent length assigned to the two ID variables. 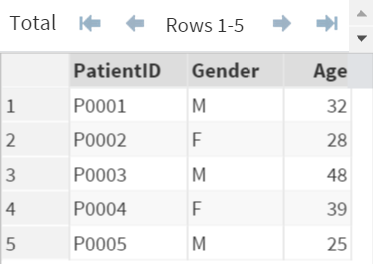 In our example, REPORT1 is listed first in the SET statement. As a result, the length of PatientID follows the length defined in REPORT1, which is 8. The length of 8 can only store up to 8 characters. This issue can be resolved by using a LENGTH statement. The Length statement assigns the length of 12 to the PatientID variable. 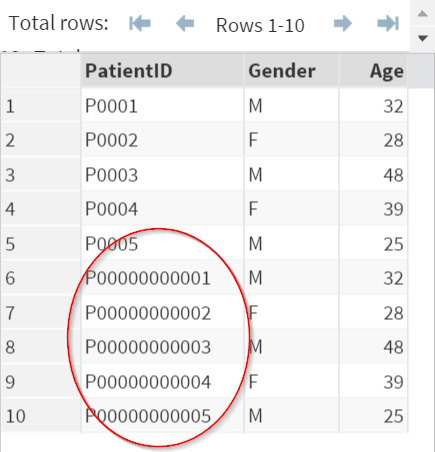 This allows the variable to capture all of the data point without being truncated. 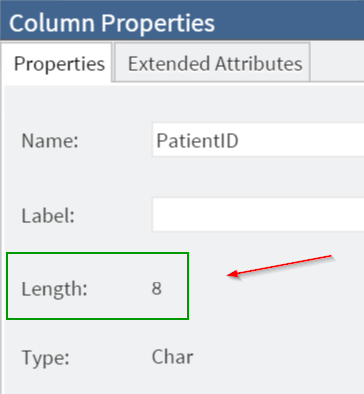 Note: the LENGTH statement must be added before the SET statement, which is where the variables attributes are defined. Once the length has been defined, it cannot be modified. 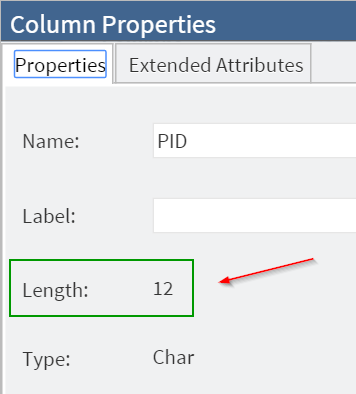 ​A LENGTH statement added after the SET statement will not work. The DESK1 and DESK2 data sets contain a list of IKEA products. 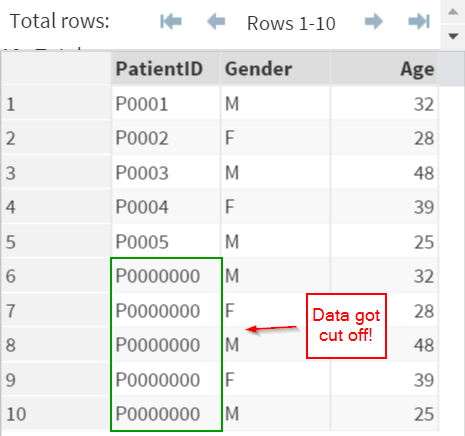 Concatenate the two (2) data sets.